Samsung promised at CES last January that it would deliver a 110-inch UHDTV this year, and with just a couple of days left to spare here it is. 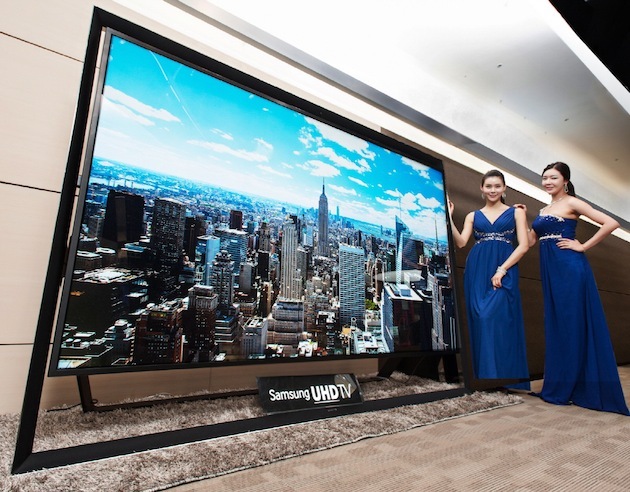 Apparently rolling out in China, the Middle East and a few European countries first, there's no word on price (the 85-inch version that launched earlier this year had a $40K pricetag attached when it launched), but can you really put a price on a TV that's bigger than a king-size bed? That's right, at 2.6-meters by 1.8-meters there's more than enough room for well-heeled VIPs or employees of large companies and government agencies (the target market for the S9110) to catch some z's on it -- and bring a few friends. It's available for custom orders just before we see the new generation of Ultra HD (including a 105-inch curved model) at CES 2014 next week, although most of us will be looking for TVs that actually fit inside our living room. Update: Even though the set is custom order only, Samsung has confirmed to us that the basic edition costs 15 million Korean won ($142,000~) -- but who sticks with just the basics?